New Delhi, March 25: The Indian Air Force (IAF) on Monday will induct the first unit of four CH-47F Chinook helicopters in its fleet in Chandigarh. With this, the Chinook helicopters will become a part of the 126 Helicopter Flight, which currently operates the last of the Mi-26 heavy lift choppers. The Chinook heavy-lift helicopters had arrived in India from the United States of America (USA) on February 10 this year. The multi-mission helicopters, which have been deployed in Chandigarh, will be used for transports artillery, troops, equipment, supplies to the battlefield. Air Chief Marshal B.S. Dhanoa will induct the first unit of four Chinook heavy-lift helicopters today. India's Air Fleet Too Vintage? IAF Has Lost 7 Warplanes Till Now in 2019. The first four CH-47F Chinooks for the IAF were brought to the Mundra Port in Gujarat in February. These helicopters were assembled in Gujarat and were then taken to Chandigarh. “The CH-47F (I) Chinook is an advanced multi-mission helicopter that will provide the Indian armed forces with unmatched strategic airlift capability across the full spectrum of combat and humanitarian missions. The Indian Air Force currently has 15 Chinook helicopters on order,” a statement released by Boeing noted. 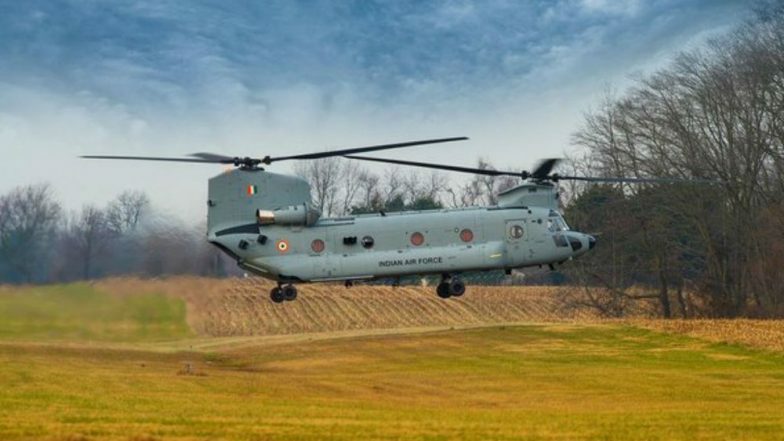 The Indian Air Force currently has 15 Chinook helicopters on order and the first four Chinooks arrived from the US in February 2019 in Gujarat. The CH-47F is an advanced multi-mission helicopter which contains a fully integrated, digital cockpit management system, Common Aviation Architecture Cockpit and advanced cargo-handling capabilities that complement the aircraft's mission performance and handling characteristics. The first batch of four Chinook helicopters arrived by sea at Mundra Port in Gujarat on February 10 and will be inducted on March 25. Chinook helicopter can carry out military operations, not only in day but during night too; another unit will be created for the East in Dinjan (Assam). The induction of the Chinook helicopters will be a game changer the way Rafale is going to be in the IAF fighter fleet. The Indian Air Force currently has 15 Chinook helicopters on order. The agreement over the sale was concluded between the United States and India on September 28, 2015. Chinook will join IAF's 126 Helicopter Flight unit which operates the last batch of Russian made Mi-26 choppers. The Mi-26 choppers are believed to be phased out soon. The Chinook helicopters can deliver heavy payloads to high altitudes and is eminently suited for operations in the high Himalayas. Reports inform that the CH-47F is operated by a crew of three people, that includes two pilots and flight engineer. The Chinook helicopter can be armed with up to three 7.62 mm machine guns or mini-guns. In September 2015, India had signed a $3 billion contract for the purchase of 15 Chinook and 22 Apache attack helicopters. The Chinook CH-47F (I) will provide the IAF with unmatched strategic airlift capability across the full spectrum of combat missions. The induction of the helicopters in the IAF fleet will boost India’s capabilities for quick mobilisation of troops in higher reaches along the Line of Control (LoC). The Chinook helicopters are being used by Armed Forces in 19 countries.